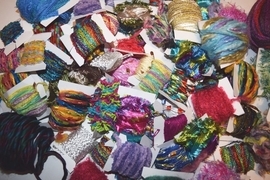 200 yards 20 colors Fiber for Embellishments Novelty yarn Grab Bag for Scrap booking, Fiber Art, Knit/Crochet, Felting, Jewelry Making, Embellishing. Each bit of fiber is a generous 10 yards. Each set of fibers will vary. 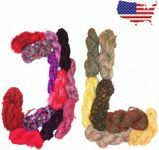 You will receive a surprising Grab bag 20 qty bobbins of assorting yarn-trellis yarn, bold ribbon yarns, silky-soft, high-fashion eyelash yarns, shimmering ladder yarns, super-soft fur yarns, colorful boucle yarns, fun novelty yarns, or yarns that are plush, loopy, nubby or have a metallic sheen, eyelash, sequins, ribbon, variegated wool, flag, net yarn. 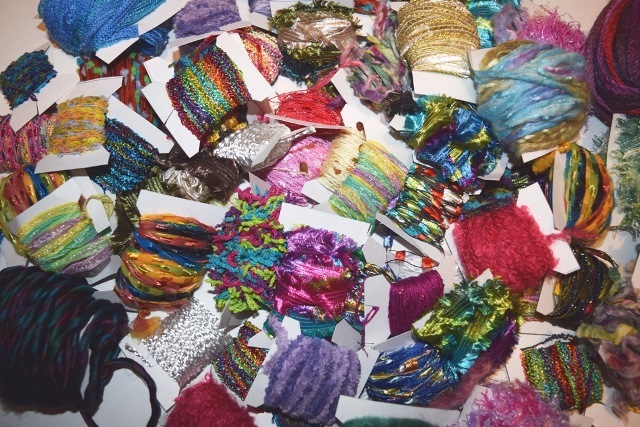 These mixed fibers and/or novelty yarns are perfect for adding color, texture and interest to your favorite DIY projects, including scrap booking, felting, fiber art, jewelry making, couching, collage making, free form knitting and crocheting, embellishing, gift wrapping and card making.